I noticed that Standard and Poor put the US Federal debt on a “Negative Outlook” yesterday. The U.S. is incurring unsustainable deficits and soaring debt. For as long as I can remember the U.S. Treasuries have been synonymous with risk-free – is that now in jeopardy? It was compiled by the very conservative Heritage Foundation. You will notice that tax collections in 2010 (and also those predicted in 2011, not shown on chart) are the lowest in over 6 decades! The reason for this is that we had a 10 Trillion dollar mugging of our economy by the out-of-control financial sector culminating in 2008. The GDP shrunk at the rate of 6%, unemployment soared to over 10% (maybe as much as 17% if you count the underemployed) , peoples’ savings and pension plans were decimated and the Federal government had to bail out the banks to the tune of trillions more. A recession of this magnitude is a once a century affair and if proactive moves were not made by the government we might have a collapse on our hands. When you have a recession not only does the GDP fall, but tax revenues as a percentage of GDP also fall – a double whammy! Conversely when the GDP shows healthy growth the tax revenues increase as a percentage of growing GDP without an increase in tax rates. 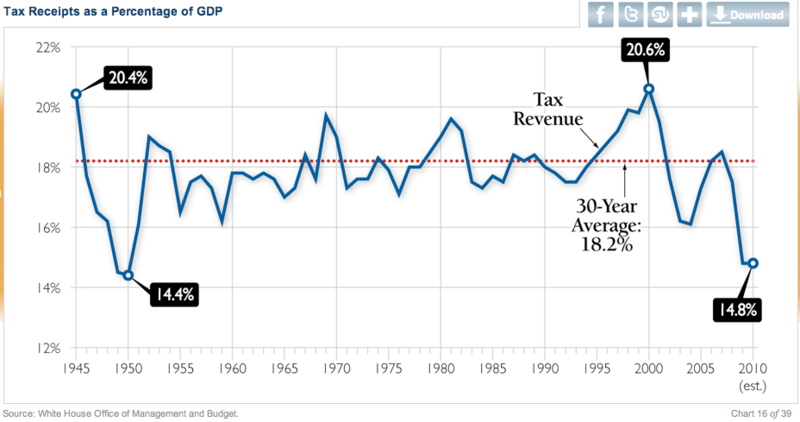 If you look at the chart above you will see that this happened in the 1990’s, mostly in the Clinton era, when 22 million new jobs were created and tax revenues soared to a historic 20.6% of GDP with a continued low tax rate. We had surpluses not deficits in our budget as late as the year 2000 as a result. We have a deficit of 10% of the GDP now and 60% or so of it is due to a collapse in tax receipts, exacerbated by a lowering of tax rates, the two unfunded wars and the financial tsunami. Also we have been forced to spend more because of the financial meltdown and recession because failing to do so would have caused a disaster. What is unconscionable though is the deficit build up of the Bush era, a time in which the economy was growing. Yes, we had 9/11. But the direction we chose as a result of 9/11 was more harmful than the bombings. Our spending problem has not been our domestic social spending. It is not related to health care or education, or Planned Parenthood, or child malnutrition programs, or illegal immigrants, or even labor unions demanding too much. If we are serious about reducing our debt we have to look at the big picture. The President’s commission on debt reduction came up the best approach so far – a balance between getting the revenues up and gradually reducing the rate of growth of entitlements. More on this in a later post.